After pulling off a fantastic comeback against Tyrone, there are two Down players in this week’s team. 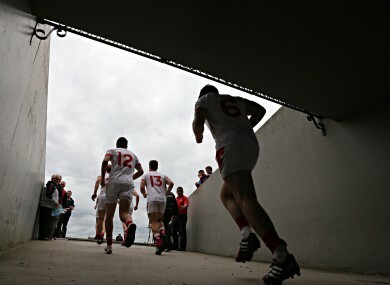 The Louth team enter the field against Westmeath on Saturday evening. He had to be on his toes throughout, and pulled off a sharp stop from Ray Connellan in the first half against Westmeath. Another solid display between the sticks for the big keeper. Collins put in a neat display in a comfortable Roscommon victory. He was tight throughout in a solid Roscommon full-back line. When your marker is taken off within a half an hour you know you’re doing something right. The Louth full-back line held Dessie Dolan and Dennis Glennon to just two points. Yet another excellent display from the rangy corner-back, starting a number of attacks from deep. Also put in a solid defensive effort against a constantly rotating Louth forward line. Two points form play for the 2011 UCC Sigerson Cup winner. A constant attacking threat from the half-back line for Roscommon. The half back was a surprise selection in the middle of the field, but his endless endeavor was certainly the platform Longford needed. He scored a point to wrap up a fantastic performance. An important point in the first half an hour edged his team ahead, while the wing-back again broke the deadlock with a finely struck 45′ early in the second half. Both vital scores before Laois kicked on to win by seven. The Louth captain really grew in to this one as the game progressed, with three big second half points. He edges out Laois’ John O’Loughlin who also pitched in with three against Wicklow. Coulter only came on at half time against Tyrone but he was certainly the catalyst as Down swamped the middle of the park in the second half. His midfield partner Kevin McKernan was excellent throughout. Munnelly was the top scorer over the weekend with nine points, most of which at crucial times as he carried Laois to what ended up as a convincing victory. Two consecutive scores, one from either wing in the second half had the crowd gasping. The big man caused all sorts of problems for the Wicklow defence. He ended the game with six points, three from play, while he was the provider for many more. Emlyn Mulligan was a standout performer for a disappointing Leitrim side. There was never any doubt over what would ensue as Cavanagh lined up his equalizing free against Down. He remains their go to man, as his five points showed on Sunday. Ciarán McGinley too worked his socks off for Tyrone. The diminutive corner-forward was vital in Down’s fightback on Sunday. Despite only scoring one point he was a constant outlet throughout the game. Derek Maguire kicked 0-5 from play for Louth. Kavanagh is a handful for any defender, as he showed once more with his three points from play on Sunday. Senan Kilbride was also in good form in Roscommon’s win. Starved of possession inside McNamee was a joy to watch against Longford, scoring seven points. At the opposite end Sean McCormack and Francis McGee were both prolific for Longford. Email “Here's our GAA football team of the weekend”. Feedback on “Here's our GAA football team of the weekend”.